Many years back I created a website on the now defunct Geocities service. 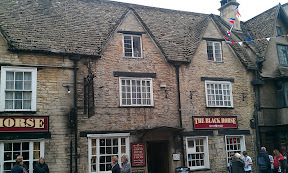 The site was intended to be a gazetteer of inns, pubs and hotels that were reputed to be haunted and used pre-researched information from a book called Haunted Inns by Marc Alexander. This was during the early years of the internet and my little corner of the web attracted plenty of attention. I would often receive emails from journalists, people interested in visiting the inns and those fascinated by the bizarre and supernatural. I was even featured in newsletters and once on BBC local radio. As time passed I was amazed by the increasing volume of visitors to the site and took it upon myself to register the domain hauntedinns.co.uk. On the back of that, I developed the site further, but by the time I was finally satisfied with the design and the content, interest was waning and I found my time taken up with working more than driving round the country looking at pubs. Times and money got difficult and the registration of the site lapsed; regretfully I archived the site and forgot all about it. Since then I have moved to the sunny West Midlands. I have the funds to journey too and fro, back and forth across the country. Occasionally I will find myself in a strange town, my brow furrowed with uncertainty as distant memories stir. “Wasn’t there a haunted inn here?” I’ll ask myself. The answer only arising when I return home and I am able to check Alexander’s book. This weekend I was in the delightful Roman town of Cirencester and once again I was certain that there was a pub in the area which appeared in Alexander’s book. After a bit of exploring I saw and photographed it, no longer for my website, more for my own records some examples of which you can see on this post. But it was upon return to Leamington Spa that I was struck by an idea. Back in the day, Google was just a word you would use to misspell goggle. Map services in the early days of the web were a bit poo and Google’s Maps sounded more like a children’s book than a service that would be used every day to snoop on and stalk people and places. Of course, these days, Google Maps is a very powerful tool especially when used with the Street View function. 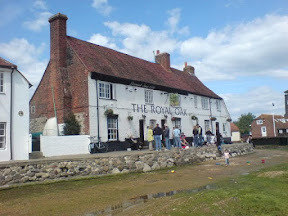 Of course it is not the same as visiting the place personally but with the ability to locate the pub and mark it on a personal digital map that can be shared and even accessed on a mobile device, I think I will finally be able to tick a few more off the list. 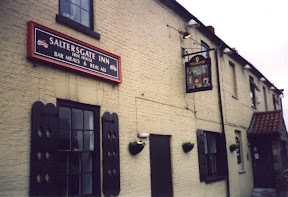 Saltergate Inn - Appears to no longer be a pub. On creating the points on the map I became more aware that over the past few years more and more village pubs have sadly closed, been demolished or even changed names. Out of the entire book of about 35 inns, 10 have closed or appear to have been wiped from the map in some way or other. Sad days. But at least I’ve managed to visit a few of them before they disappeared forever, their memories confined to pages of books, grainy photographs and blog posts…. The Saltergate building is still there but in the last 18 months or so that I’ve driven past it, it has been surrounded by that construction site fencing stuff to deny access and all windows are boarded up. Which is really sad, as I reckon if it were opened as a B&B pub it would do great business. I suspect the reason it closed is that it’s not in walking distance from any of the nearby towns/villages, so you’d either have to be going for a meal or staying there to want to drink there.